A foodie’s paradise with a community feel in an up-and-coming corner of south-east London. Located in increasingly lively Bermondsey, Maltby Street Market is a bit like a calmer, more curated version of Borough Market. It’s only been going since 2010, doesn’t open during the week, and the tourists haven’t quite cottoned on yet. So, if you can’t face the masses, this is the place to come when you’re having a Nigella moment and want to stock your kitchen cupboards with high-end condiments and tipples you can’t get at Tesco. 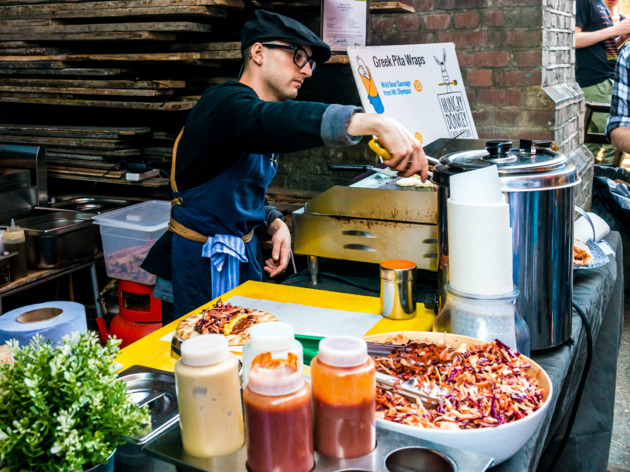 Nestled in and around the atmospheric Victorian rail arches of the Ropewalk you’ll find around 30 artisan food and drink traders selling everything from craft beer to Mozambique-style peri-peri meats. If you’ve got a sweet tooth, Bad Brownie’s gourmet chocolate brownies are definitely recommended. If you’re on a health kick, grab a green juice from the good folks at Bumpin’ Rinds. If you don’t fancy snacking on the hoof, you can tuck into classy comfort food at St John Maltby, a bright and airy restaurant that gets pretty busy and doesn’t take bookings. And if your stomach’s still not fully satisfied, just saunter half a mile down the road to Spa Terminus, where around 25 food producers sell top-notch cheese, wine, ice cream, honey and coffee – we’re talking Monmouth, obviously. These quaint markets make for a lovely weekend stroll and will guarantee to satisfy your hunger and thirst. Brazilian Steak and Haloumi wrap. This was delicious and satisfyingly filling. The tortilla was slightly crispy from being toasted and the beef was succulent and tender. I opted for extra haloumi cheese and guacamole and it definitely hit the spot and cured the drizzly weather. Dessert at Comptoir Gourmand: Choux pastry bites, spicy hot chocolate, lamington, gallette des rois (french pastry filled with almond paste). The choux pasty was light and moreish; the lamington had the perfect amount of jam in the middle and the gallete des rois had a lovely crusty pastry and the almond paste wasn’t too overly sweet - the baked goods here definitely will satisfy that sweet tooth. The spicy hot chocolate needed a bit more kick and was a touch too sweet for my liking; but the consistency is like a nice velvet hug around your heart, so you can’t say no to that. Tip: Great for a bit of a weekend wander (and tipple) so that you feel a little productive and literally follow your nose to what tickles you fancy. Do check out the antique store, the amazing selection of scotch eggs and the ever so comforting cheesy goodness from the cheese toastie stand - can’t miss it. A delicious experience! I loved that this food market was a little hidden away from the buzz of central London and that there were few tourists. It was rather crowded on a Friday night and my friends and I waited a very long time to get food but it was worth it! I had a wonderful burger packed with bacon, cheese, spicy sauce, and a deliciously buttery and toasted bun. We also had drinks from the gin place, which was really good. It was very strong and had a hint of a grapefruit aftertaste. One of the best food markets in town - check out the vid which I'm presenting on the main page for a full breakdown! Top orders for me though are Greedy Khao, Bad Brownie, and African Volcano! Go early as it gets super rammed on later on, and there's few if any seating available! These hidden markets are an ideal way to spend your morning. Particularly if you're somewhat hungover and are looking for a feast. Whether it's scotch eggs or custard tarts, there really is everything. Rain, hail or shine, this spot is always pumping. A foodie's dream! 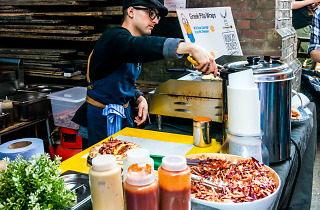 An awesome alleyway of street-food favourites, this is a perfect way to spend a Saturday morning (just try not to eat before-hand as you'll instantly regret it, given how much fine fare is on offer here). As well as temporary stalls, there are permanent restaurants and some of the other businesses give over their space to other vendors at the weekend (very cool to see wine & BBQs in the midst of a timber yard!). Reward yourself at either the start and end of the alley, with brewery stands and outlets at either end of the walk - if you fancy putting your feet up, the Hiver Tap Room brews some fantastic honey based drinks and also has a chiller with some of the world's best beers, including NZ Tuatara. This market has grown and grown but kept its charm. It's certainly one of London's boozier markets with a justified emphasis on local brewers and distillers. Try one of everything! Great atmosphere with plenty of food and drink will never go hungry.. Wide variety of delicious food! Very friendly street vendors, homemade feel and lovely diverse visitors. Similar to borough market, minus crowd of tourists! So aside from Borough food market, the one that everyone is familiar with and knows, is this little secret foodies favourite just down the road, tucked away on Ropewalk in Bermondsey. There is a small selection excellent quality stalls with tempting treats sure to draw your attention, bordered by interesting little eateries, haunts and bars that also worth peeking into as well. We tried the tamales that weren't much to look at but surprisingly tasty, generously portioned sub sandwiches with unusual combinations from sub-cult, these I would definitely recommend. Dan ya are interesting bite sized waffle egg shaped doughnuts dipped in a selection of salted caramel, creme custard and Nutella chocolate with optional sprinkling of peanut brittle. Cleverly served in egg boxes, these were absolutely delicious and not too heavy afterwards. However when we visited on a Sunday, there were not a vast amount of drinks available and limited seating. Never the less great to enjoy and explore if you fancy something different from Borough market during the weekend only a leisurely stroll away from the south bank. Best Market in London... Love that Pic's is there with healthy Peanut Butter Milkshakes! This market is the Mecca of a foodie. It has changed over the years but one thing is for sure: it has amazing food stalls and a great vibrant atmosphere. Young professionals, artists, students, all city's young people (OK maybe some older ones as well) are gathering there every weekend, queuing to get the best grilled cheese sandwiches in town, try some delicious waffles, try out the Taiwanese street desert that tastes like waffle, buy some Greek wine or just sit and enjoy some awesome gin cocktails or just try little bird gin at the Little Bird Residency (where you're allowed to bring food from the market). It gets so busy especially when the weather is good. If you haven't been yet, you should schedule it for your next available weekend! I am a market lover and Maltby Street Market is one of my favourites. Really well positioned, close to the Tower Bridge and easy to go to, it's filled with amazing stalls for foodies. My favourite place to eat must be The Cheese Truck, the best grilled cheese you can find in London in my opinion. Their flavour combos are to die for - just thinking of their chorizo or goat's cheese/honey sandwiches makes my mouth watery - they're quite cheap (about £4,50) and fast. No wonder there's always a long queue waiting! Believe me, you must go there. Check out heir Instagram to have an idea of what I'm talking about (@thecheesetruck)! Great vibe and delicious street food. Not pretentious. Love the gin bar. One of London's hidden gems, great food, fantastic gin, and boutique breweries! So pleased this little market popped up and has now extended its hours to Saturday and Sunday! Tucked away from the overwhelmingly busy borough market, this small ally hides some of London's best street food stalls and provide seating space in furniture vintage shops. Don't miss out on St. John's doughnuts too!